A couple of cool Hike 734 mentions around the internet that I’d like to draw your attention to. This is more about them than me. Check out the blogs that mentioned me. You’ll be glad you did. Adam Nutting is working his way through the Appalachian Trail and has a great blog documenting his progress. He has a great feature of his site called the “Golden Boots Blogger Award” where the award recognizes “outdoor adventure bloggers who are adventuring and providing amazing stories.” I was nominated by someone from the outdoor community and was one of the November winners! 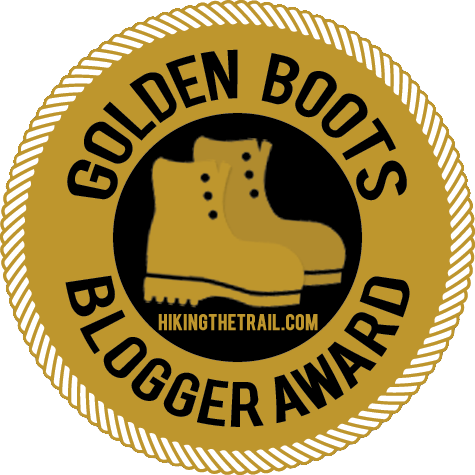 Check out his site, Hiking the Trail, for other great Golden Boots Bloggers. Thanks Adam! Kurt Repanshek has been doing an amazing job of blogging about news and issues around all of the National Parks for years. His site, National Parks Traveler, recently reviewed my two Glacier Map Guides in his typical thorough fashion. Swing on by to read the post and stick around for the other engaging articles. (Also, consider supporting his efforts through a membership. Blogging takes up way more time than you may realize and, in order to have such great content, you need to do it full time.) Thanks Kurt! I’ll be getting more video blogs out shortly. A recent tonsillectomy put a damper on the talking. I’ve got some fun stuff coming up, so stay tuned. I’m super excited about the coming year!